The dramatic play area in my classroom is always very popular. Last month we had a very fun pumpkin patch filled with pumpkins big and small and with a hay stack in the middle of our classroom. We just got rid of the pumpkin patch and the hay....and after vacuuming several times - everything is gone! Now is time for a change. We have transformed our dramatic play area into a grocery store! With the help of Grocery Store Dramatic Play product from the wonderful Jamie at Play to Learn Preschool, I was able to put together this wonderful leaning area for my students. This is the welcome sign for the Grocery Store. 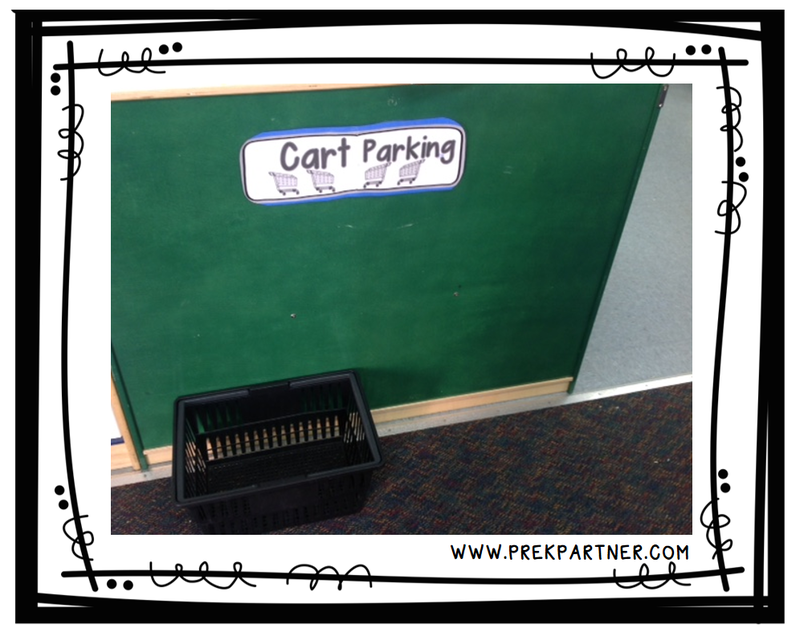 To begin the shopping experience, the students will need a basket or a shopping cart (coming soon). Love this area! The signs are part of the product. Here's the cash register area, the area to weigh the produce and a pace to make the shopping list. A close-up to the shopping lists. The sign should read "Shop Smart" but my camera cut the "S"! The refrigerator houses the dairy products. The pantry has all of the canned goods and the cereal boxes. On the right side we have the reusable bags and the purses to carry the shopping money. This is one of my favorite parts - incorporating science and math into the grocery store. The students will be able to weigh their produce for a better shopping experience! On the shelf we have all of the "fresh" produce, along with the labels for each items. This area will provide many learning experiences and cooperative play. Sofia is very excited about her contribution to the classroom grocery store! She helped assemble it tonight! Hi Jessica, it is my goal to involve the students and families in all the classroom happenings - that way they feel pride for everything they do and develop a sense of belonging!